Already own in Pleasure Isle Villas? Thinking of selling? Click here and read about current search trends & our web network. 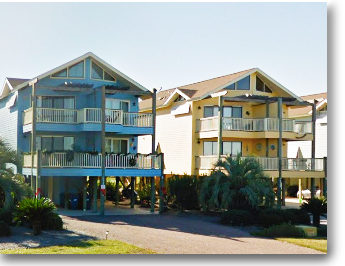 The colorful Pleasure Isle Villas condos are located in the West Beach area of Gulf Shores, Alabama. The property is made up of a number of duplexes that sit on stilts, with room for parking your car underneath the building. The property is beautifully landscaped and the duplexes have been well-maintained. At the center of the property is a spacious outdoor pool, gazebo, and tennis court. Pleasure Isle Villas residents and guests enjoy deeded beach access on the Gulf of Mexico just 300 feet away. With a grocery store and restaurant just a few steps away, you can find all you need to kick back and relax within easy walking distance. Please let us know if you would like further info for Pleasure Isle Villas or any other condos, homes or real estate along the Gulf Coast or would like to schedule a private viewing by emailing info@condoinvestment.com or by calling (251) Area-Pro (251-273-2776) for immediate assistance.